These messages are research based, Safe & Sound Sleep Solutions™. Unwind and release tension with relaxing meditations, sleep tips, visualizations and My Inspirational Lullabies™ for dreamers of all ages. 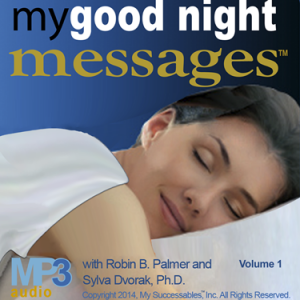 My Good Night Messages™ created by inventor, Robin B. Palmer and Psychoneurologist, Dr. Sylva Dvorak. My Inspirational Lullabies™ were written and recorded by Broadway star, Robin Boudreau Palmer. Safe and sound sleep solutions relieve stress and relax you before you fall asleep every night. Messages include research-based, natural sleep tips and tools, relaxing meditations, and My Inspirational Lullabies™ – for dreamers of all ages. Do you suffer from insomnia or sleep deprivation? Sleeping pills now lead the list of prescribed drugs. Psychoneurologist, Dr. Sylva Dvorak and Robin B. Palmer, inventor of My Wake UP Call® Motivational Alarm Clock® Messages, created My Good Night Messages™, research-based, sleep solutions so you can enjoy the good night’s sleep you’ve been dreaming of – safely and naturally. Enjoy the great night’s sleep you’ve been dreaming of and deserve! Dr. Sylva Dvorak holds a PhD in Psychoneurology and Integrative Healing from Beurin University and undergraduate and graduate degrees from the University of Michigan, Ann Arbor. Dr. Sylva has consulted with numerous Fortune 100-500 companies and currently, serves as Chief Development Officer for One World Projects, Inc., and is on the Faculty of Beuirin University. Dr. Sylva has a private practice based in Southern California and other locations. She has also published numerous articles, is the co-author or “Health Fairs for the Healthy Workforce,” and is completing her first solo authored book. As far back as Dr. Sylva can remember she started having mystical experiences, and memory of past lives, at the age of 13 she had an experience of direct contact with Source Light which lead her on a path of studying and participating in numerous spiritual philosophies and practices. Later she pursued more formal studies in health and healing along with the inner workings of the mind. Dr Sylva has a passion for integrating ancient wisdom with our newest understandings of the body, mind and spirit. Dr. Sylva is originally from the Czech Republic and spent time in refugee camps as a child. Her passion is to help others find their personal freedom which forms the foundation of all her work. Robin (Boudreau) Palmer starred in Broadway musicals for fifteen years. Some favorites include playing Linda Ronstadt’s little sister in THE PIRATES OF PENZANCE with Kevin Kline, co-starring with David Cassidy in JOSEPH AND THE AMAZING TECHNICOLOR DREAMCOAT and singing Memory in CATS. Robin invented and patented My Wake UP Call® Motivational Alarm Clock® Messages; daily five-minute messages which start every day positively, instead of a blaring buzzer or “alarming” news on the radio. She now has a series of new products designed to help customers start and end every day positively and live the life of their dreams with My Good Night Messages™. Robin has also written, recorded and performed a new album, My Inspirational Lullabies™. 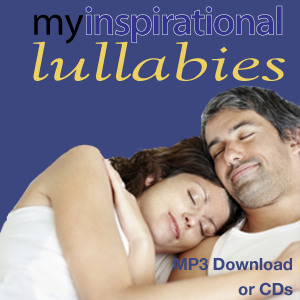 These original songs set a positive tone for dreamers of all ages to fall asleep effortlessly and to sleep peacefully. Customers currently choose from sixteen product lines to wake up and work out, lose weight for life, relieve stress, find financial freedom and more with well-known experts and thought leaders Marci Shimoff, HH the Dalai Lama, Jack Canfield, Michael Bernard Beckwith, Janet Attwood, Marianne Williamson, Mary Morrissey, Debra Poneman, Discover the Gift movie creators, Shajen Joy Aziz & Demian Lichtenstein, and many others. Customers report that My Wake UP Call® Messages have changed their lives and that they also listen to messages anytime they need a boost during the day. My Wake UP Call® Messages have been featured in SHAPE, SELF, Oxygen, Woman’s World, USA Today, on Fox and NBC TV. Robin is grateful to husband Tom for his graphic designs, website development and for engineering the recordings.